For a long time, Verbatim has been a reputable company manufacturing many different devices and accessories, including hard drives. Recently, their PR team sent us a 320GB InSight: a portable USB hard drive with a display which never turns off. 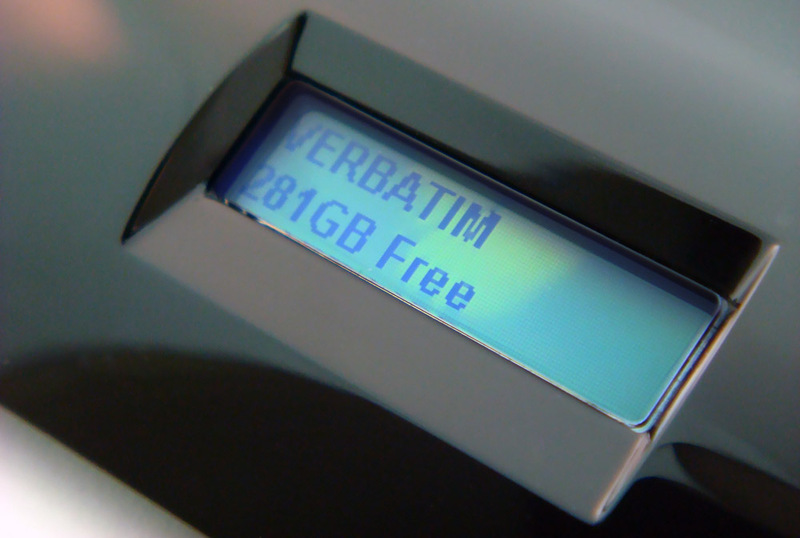 This innovative LCD design allows the user to conveniently check on the remaining storage space without plugging the InSight into a computer. Check out the review below to find out more. When I first unboxed the InSight, the body immediately caught my eye. The glossy-black finish compliments the sleek design, but also attracts many fingerprints. As you can see from the pictures, the curve in the body creates a bump at the front of the hard drive to account for the small LCD screen. A small LED light located at the tip of the hard drive flashes blue whenever the InSight successfully connects to a computer. The most unique part of the InSight is the always-on LCD screen which displays both the “VERBATIM” name and the remaining free space. At first, I felt a bit skeptical about the inclusion of a LCD because I did not see an advantage in having it on the device. However, the simple convenience of knowing your available hard drive storage space without connecting it to a computer helps. Unfortunately, the review unit we received had a fairly noticeable blemish on this screen, but it did not distort the display in any way. Overall, I felt pleased with the slim, solid feel of the InSight. 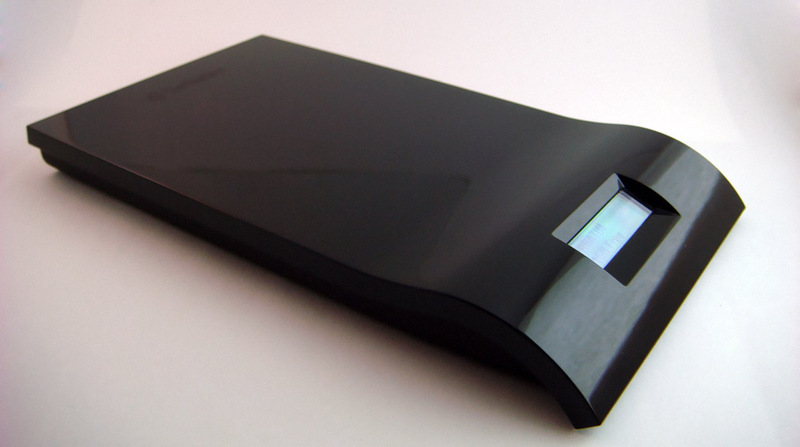 In terms of performance, the InSight matched other external hard drives on the market. The speeds I recorded did not differ greatly from other models; both the read and write speeds were slower than it’s sibling, the Verbatim Clon HDD. To transfer a 700MB movie to the hard drive, it took less than one minute. Transferring the same file back to my computer took about one minute and fifteen seconds. The benchmark results do not differ greatly from the speeds I saw. The read speeds came out to an average of 28.3 MB/s, whereas the write speeds came out to 20.7 MB/s. When connecting to a computer, the LED light turns on and the LCD displays “Scanning”. If the InSight successfully connects, the blue LED stays on and the screen reads “VERBATIM” and informs the user of the amount of space available. Similar to many other storage devices, this one comes with plug-and-play technology. Initially, I was able to sync it with both my Windows 7 laptop and Ubuntu desktop with no problems. However, as soon as I connected the InSight to my Pogo Plug, none of my computers recognized it anymore. For over a week, I tried using other people’s computers. However, none of them recognized the device and therefore I could not format it. Hence, it seemed futile that I would lose the files I stored. Eventually I connected the InSight to a newer model of a Dell Insipron. For some reason, the laptop recognized it, so I quickly transferred my files off. Unfortunately, I did not format the InSight using the Dell, so I am still unable connect to my personal HP laptop. I searched around for a solution, but it seems that no one experienced this problem. So just remember, be careful if you use a Pogo Plug! Other than the unique situation described above, I felt satisfied with Verbatim’s hard drive. The always-on display is nothing spectacular, but does provide a nice convenience. In terms of transfer speeds, the InSight did not outshine other hard drives, but performed on par with other models on the market. Despite the glossy black finish, I like the sleek and stylish look of this portable device. For the price, I would recommend this product to both the casual and heavy computer user looking for an external hard drive.